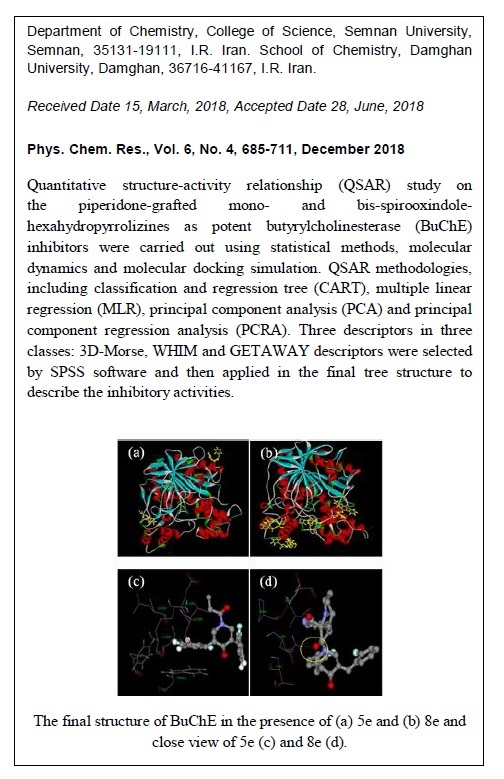 ABSTRACT: Quantitative structure-activity relationship (QSAR) study on the piperidone-grafted mono- and bis-spirooxindole-hexahydropyrrolizines as potent butyrylcholinestrase (BuChE) inhibitors were carried out using statistical methods, molecular dynamics and molecular docking simulation. 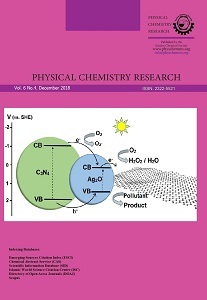 QSAR methodologies, including classification and regression tree (CART), multiple linear regression (MLR), principal component analysis (PCA) and principal component regression analysis (PCRA). Three descriptors in three classes: 3D-Morse, WHIM and GETAWAY descriptors were selected by SPSS software and then applied in the final tree structure to describe the inhibitory activities. Docking simulations were carried out using AutoDock Vina softwares for all inhibitors. Docking results showed that the studied BuChE inhibitors have two commons binding modes. Molecular dynamics results obtained by Gromacs showed that the more potent inhibitor has more interaction with the enzyme and higher effect on the enzyme structure.